Until the progressive boom of the late 1960's came and shook the status quo, rock music from mainland Europe was of little consequence. Caught in an anglo-american stranglehold. The majority of Euro rockers offered up nothing more than pale imitations of the styles developed by musicians from both sides of the atlantic. Complete with English lyrics. And it wasn't just what they had picked up from records - in Germany the situation was compounded by the many British bands (The Beatles, most famously) who used the bars and clubs in major ports of call such as Hamburg to break themselves in before returning home to storm the commercial barriers. Formed in 1971, Faust were not the first German band to assert their own voice on the international stage, but they were by far the most radical. Holed up in the studios with an enlightened and encouraging producer, Uwe Nettlebeck, and a cache of new tech, they produced electro-acoustic experiments that were savage and uncompromising, and with precious few reference points to rock music from either side of the atlantic. The Velvet Underground may have provided some initial inspiration, but they junked their appreciation od noise-as-aesthetic after John Cale left them in 1968. Faust's third album, The Faust Tapes (their first for Virgin), compiled from the band's library of private tapes may also have alluded to Zappa with its brusque collage effects, but the link is tenuous at best. The pieces on Faust IV, like the bands first two albums for Polydor (Faust and So Far) are allowed the time and space to develop fully as streams-of-consciousness. It would be pushing things to call them 'Songforms' although Faust were happy to utilise popular forms: the pre-dub experiments on So Far give way here to a more conventional, jocular stab at reggae with The Sad Skinhead, whilst It's a Bit of a Pain is a lyrical acoustic number rudely thrown off balance by retching electronic sounds. Contrast these with the opener, Krautrock, with its trance rhythms and searing electronic noise nodding in the direction of the post-John Cage generation of 'systems' composers (especially Philip Glass). Calculatingly, Faust's influence on contemporary music is far easier. British avant-rockers Henry Cow and the later This Heat, who similarly tested the definition of rock music to near breaking point, owe them a sizeable debt, whilst the generation of industrialists which followed - everyone from Throbbing Gristle to Controlled Bleeding - would have been much the poorer without Faust's trailblazing inventions. 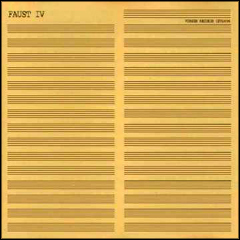 Faust IV was not as ruthlessly avant-garde as its predecessors, although as a more conventionally polished product it's probably the best place for the uninitiated to start. It wasn't the last recording they made, although it was the last to be released during the band's lifetime. By 1975 it was all over - or so we thought. During the late 1980's the avant-garde indie label ReR MegaCorp scooped up previously unissued materrial for inclusion in two posthumous releases (Munic and Elsewhere and The Last LP), and earlier this year there emerged the long-awaited evidence of Faust's much rumoured reformation (a brief live recording featured as part of a giveaway single with vol 2/3 of the American music quarterly, Chemical Imbalance). The last of their albums to make it on to CD, Faust IV is simply one chapter in the life of an extraordinary group. Pop it into your CD player, crank the volume up to maximum and let this classic music roar into your head.